"Two-photon physics, also called gamma–gamma physics, is a branch of particle physics that describes the interactions between two photons. If the energy at the center of mass system of the two photons is large enough, matter can be created..."
Note thought that the article says "From quantum electrodynamics it can be found that photons cannot couple directly to each other". That's wrong. Pair production doesn't occur because pair production occurs, instead two photons interact. Recognition of this might lead to an important advance in physics. "Imperial physicists have discovered how to create matter from light - a feat thought impossible when the idea was first theorised 80 years ago. In just one day over several cups of coffee in a tiny office in Imperial’s Blackett Physics Laboratory, three physicists worked out a relatively simple way to physically prove a theory first devised by scientists Breit and Wheeler in 1934..."
johnzxcv and Nic like this. You quote mined the Wikipedia article! The full sentence said: "From quantum electrodynamics it can be found that photons cannot couple directly to each other, since they carry no charge, but they can interact through higher-order processes." "A photon can, within the bounds of the uncertainty principle, fluctuate into a charged fermion–antifermion pair, to either of which the other photon can couple." It just isn't true. Pair production does not occur because pair production occurs, spontaneously like worms from mud. A photon does not spend its life morphing into an electron-positron pair which then morph back into a single photon which nevertheless manages to propagate at the speed of light. One photon interacts with another, that's all. Look further down that article and you even see stuff like this: "The photon couples directly to a quark inside the target photon". Tsk. It doesn't. Physics is time-symmetrical. Gamma-gamma pair production is like electron-positron annihilation played backwards. The point is that photons do interact with photons, and yet there's a myth that says they don't. In quantum field theory (as opposed to explanations aimed at laypeople), if we say that field A interacts directly with itself, that's a universal standard shorthand for the statement that there are terms involving cubic or higher powers of A in the Lagrangian (by which I really mean the Lagrangian density). What that means in the physical world is that you can have A--A scattering processes without needing other fields to get involved. In the particular case where A is a gauge field (photon, gluon, ...) this means that the gauge bosons have to carry a non-zero charge of the type corresponding to the interaction that the field mediates. E.g. in QCD, which is a theory of this type, you find that gluons necessarily carry color. In QED, and also in the more complete standard model of particle physics, there are no such terms for the photon field in the Lagrangian. What you do have instead is a term involving one factor of the photon field A and two factors of the electron-positron field ψ, like this: . This gives rise to several interesting processes (to make a huge understatement), among which are some in which photons interact with photons via the electron-positron field. Of course, there are similar terms involving the other charge-carrying fields too. 1. Photon-photon interactions are mediated by charged fields (e.g. electron-positron). 2. Photon-photon interactions occur by means of a mechanism which we don't know how to model within quantum field theory. Given the great successes of quantum field theory in predicting experimental outcomes in all manner of scenarios (including experiments involving pair production), and given the current lack of a worthy contender for the second possibility, I lean heavily towards the first. In quantum field theory (as opposed to explanations aimed at laypeople), if we say that field A interacts directly with itself, that's a universal standard shorthand for the statement that there are terms involving cubic or higher powers of A in the Lagrangian (by which I really mean the Lagrangian density). What that means in the physical world is that you can have A--A scattering processes without needing other fields to get involved. This is good. Especially when we're talking about the photon field and electromagnetic four-potential and the photon taking many paths. The word scattering is a little unfortunate in that it suggests billiard-ball collisions, but we know we're dealing with potential-field-pulse-wave entities so it isn't a problem. Particularly since Feynman "wished later in life he had been taught to think in terms of the electromagnetic potential instead, as this would be more fundamental". In the particular case where A is a gauge field (photon, gluon, ...) this means that the gauge bosons have to carry a non-zero charge of the type corresponding to the interaction that the field mediates. E.g. in QCD, which is a theory of this type, you find that gluons necessarily carry color. Gluons are not a great example due to "confinement". The gluons in normal hadrons are virtual. So let's try that for photons: the gauge bosons have to carry a non-zero charge of the type corresponding to the interaction that the field mediates. No. They don't. Photons don't carry any charge at all. And electrons and protons don't actually throw photons at one another. Hydrogen atoms don't twinkle. This isn't so good. In QED, and also in the more complete standard model of particle physics, there are no such terms for the photon field in the Lagrangian. What you do have instead is a term involving one factor of the photon field A and two factors of the electron-positron field ψ, like this: . I told you there were far-reaching consequences. You have two photons, poised to interact. You don't have any electrons or positrons yet. This gives rise to several interesting processes (to make a huge understatement), among which are some in which photons interact with photons via the electron-positron field. Only they don't. You don't have any electrons or positrons yet. Of course, there are similar terms involving the other charge-carrying fields too. Option 1 has worked "after a fashion" because you can consider the leading portion of a photon to be a little like a partial positron, and the trailing portion to be a little like a partial electron. But it's clearly unsatisfactory because it has an inherent tautology: the photon-photon interaction that creates the charged fields cannot be mediated by them. Pair production does not occur because pair production occurred. So option 2 is the correct option. Only whilst you don't know how to model it in QFT, you do know how to model it, at least in outline, because you know about classical electromagnetism and its "screw" nature, and about TQFT. It's something like this: as a photon goes past you, you will measure a time-varying electric field. Because the photon is a form of displacement current. The field-variation increases then decreases, so this displacement current is alternating. Impedance is resistance to alternating current, and we speak of vacuum impedance. When one photon interacts with another, they both "scatter", or change direction. They displace one another. Displacement current does what it says on the can. The usual thing is a displacement one way then the other, so there is no net displacement. The photons effectively "ride over one another" like ocean waves do, so it looks like photons don't interact. But in pair production the displacement is fiercer. Each photon is displaced into itself, then displaces itself forever in a closed path. Dirac's belt style. A bispinor. What was a field-variation now looks like a standing field. You call it the electron field, you talk of charge, but it's just a chiral configuration of the photon field really. Like a knot. And when you move it, you call it conduction current. But displacement current is more fundamental. And the photon field is more fundamental than the electron field it is said to mediate. All interesting stuff, and plenty to think about. So is an electron a trapped photon then? Gluons are not a great example due to "confinement". The gluons in normal hadrons are virtual. QCD is just one example of the more general phenomenon I was referring to. You could also consider electroweak theory, or simply invent a non-Abelian gauge theory of your own (SU(5), SO(10), ...). They all have the property that the gauge bosons interact directly with one another, and carry the type of charge corresponding to the force the gauge field mediates. That's just how gauge theories work. So let's try that for photons: the gauge bosons have to carry a non-zero charge of the type corresponding to the interaction that the field mediates. No. They don't. Photons don't carry any charge at all. Indeed they don't! And that is because electrodynamics is an Abelian gauge theory (the gauge symmetry is the circle group, U(1)) in which the gauge bosons (photons) simply cannot interact directly with each other. They need help from a field which carries charge, like the electron-positron field. And electrons and protons don't actually throw photons at one another. Hydrogen atoms don't twinkle. This isn't so good. Note that I didn't mention virtual particles (I actually made a point of avoiding them). This Lagrangian is incredibly simple, although it may not look it if you're unfamiliar with these things. You can solve it completely without having to touch perturbation theory at all, and you find that it describes a world in which fixed numbers of photons, positrons and electrons fly around without ever interacting. There is no Compton scattering, no bremsstrahlung, no pair production, no annihilation, no photon-photon interactions... it's pretty boring, really. So you see that it's the coupling between the photon field and the electron-positron field that makes all of the interactions described by QED possible. Option 1 has worked "after a fashion" because you can consider the leading portion of a photon to be a little like a partial positron, and the trailing portion to be a little like a partial electron. But it's clearly unsatisfactory because it has an inherent tautology: the photon-photon interaction that creates the charged fields cannot be mediated by them. Pair production does not occur because pair production occurred. 1. There is a field which transforms in a non-trivial way under Lorentz transformations. 2. The theory has a non-trivial local gauge symmetry. That's it. No tautologies required, just a pair of simple postulates from which everything in electrodynamics follows. It is as simple as an interesting relativistic quantum theory can be, and wildly successful, experimentally speaking. While it is not utterly perfect (in terms of experimental agreement), it is almost certainly on the right theoretical path. So option 2 is the correct option. There's a lot to address there, and I'm conscious of the fact that we've dragged this thread a fair distance sideways already, so I'll just say that while I'm all for speculation (and I've done my fair share), the only way to be sure whether an idea is correct is to test it against experiment. If we want to argue that a particular alternative to the standard model is better, we must be able to show that it makes better predictions than the standard model. Until we've done that, it is premature to assert with confidence what the right option is. As it happens, I posted about this on another forum quite recently. It turns out that there is a way you can make a charged particle out of something a bit like the electromagnetic field (you can create something called a 't Hooft-Polyakov monopole in a Yang-Mills gauge theory), and you might even get the right mass and spin by playing around with the theory, but there's no evidence that this is how nature works. I'm not sure if the size would work out, either (monopoles tend to have an extended structure which should show up in experiments, whereas no such structure has been found for electrons). As for literally making an electron out of a photon, that won't work for various reasons. In QCD (the theory of quarks and gluons), you do get something like this happening, at least in theory. So-called glueballs are formed entirely of gluons (which are the QCD equivalent of photons). There are even hints of experimental evidence for these states, although still nothing definite as far as I know. The primary reason that QCD permits this sort of state while QED forbids it has to do with the fact that gluons carry "QCD charge" (usually called "color"), while photons don't carry any "QED charge" (the familiar type of charge). Well, you can literally make electrons and positrons out of photons in pair production, and when you annihilate them you get photons again. That's like you have two gedanken mirror-boxes, each containing a 511keV photon. When you open one box with the other, each becomes a radiating body that loses mass. All of it. And then it isn't there any more. On top of that you can diffract an electron. It's got a magnetic moment so something's going round. And in atomic orbitals electrons "exist as standing waves". And then there's the Einstein-de Haas effect which "demonstrates that spin angular momentum is indeed of the same nature as the angular momentum of rotating bodies as conceived in classical mechanics". The wave nature of matter is beyond doubt. There's overwhelming evidence that the electron is some kind of chiral-bispinor electromagnetic wave thing, some rotary standing-wave standing-field configuration, a self-trapped photon if you prefer. Call it what you will, but for some reason there is no real electron model in the Standard Model. It's just "a fundamental particle". I'm forever banging on about this, saying there's work needed "within the Standard Model" rather than "beyond the Standard Model". I can't explain why the HEP guys don't seem to appreciate this. It's like a low-hanging-fruit thing combined with can't-see-the-wood-for-the-trees. Note my response to btr below. ...As for literally making an electron out of a photon, that won't work for various reasons. Pair production works. You make an electron and a positron out of a photon which is effectively "split over a nucleon". We've known about it since 1933. And we are confident that gamma-gamma pair production will work, where you make and electron and a positron out of two photons. We wouldn't expect to be able to make one electron out of one photon because of issues with conservation of charge and conservation of angular momentum. ...They all have the property that the gauge bosons interact directly with one another, and carry the type of charge corresponding to the force the gauge field mediates. That's just how gauge theories work. And what we have is "gauge" bosons interacting with each other, but they don't carry charge. Indeed they don't! And that is because electrodynamics is an Abelian gauge theory (the gauge symmetry is the circle group, U(1)) in which the gauge bosons (photons) simply cannot interact directly with each other. Only they do! As I said, the implications are far-reaching. The Standard Model needs an electron model wherein charge is modelled! What is it, how does it arise in pair production, and why do particles attract and/or repel. I've noticed you've been avoiding them. I wish people would call them field quanta myself. Careful - I didn't say there were actual electrons or positrons at this stage (and I stress again that I'm completely avoiding the virtual particle language of perturbation theory); what I said is that photons interact via the electron-positron field. If you examine the QED Lagrangian, you'll see that the only interaction term in the whole thing is , i.e. the coupling between the photon field and the electron-positron field. I'm going to lay it on the line: there aren't two fields. Remember how I was saying the electric field and the magnetic field are "two aspects of the greater whole"? It's the same for the photon field and the electron field. The electron field is just the photon field with a twist. It's a particular configuration of the photon field, that's all. So the coupling is between the photon field and the photon field. That's all it ever was, even in Compton scattering. Oh, Compton scattering. I swear I didn't read ahead. As for the Lagrangian, my eyes glaze I'm afraid. Things do interact, there is Compton scattering, and so on. And the moot point is this: photons interact with each other, and if your theory says they don't, you need to fix it. Don't get me wrong. I actually think the interpretation is the problem, not the theory itself. QED "works". And like you said: There is a field. A field. What I'm talking about isn't an alternative to the Standard Model. It's completing the Standard Model. The point is that by omitting the latter part of the quoted sentence, you gave the false impression that QED is unable to model electron-positron pair production. As for the Lagrangian, my eyes glaze I'm afraid. Given that you have written quite a bit that contradicts contemporary physics, shouldn't you perhaps take the time to follow the relevant mathematics? Just for yourself to make sure that you are correct? It's no false impression. This is the whole point of this news. QED doesn't model pair production in any meaningful way. It basically says "two photons pop out of existence and an electron and positron pop into existence". It's not enough. To complete the Standard Model we need more than that. And we need to remove the first free parameter, which is electron mass. We need to explain why the electron has the mass that it has, why it has the charge that it has, and so on. I haven't written anything that contradicts contemporary physics. I've referred to the contemporary physics. Things like pair production and the wave nature of matter, and electron diffraction and spin angular momentum and annihilation. People who say the electron is a point-particle contradict contemporary physics. I haven't written anything that contradicts contemporary physics. That seems to be a lie, given that a cursory search of the internet finds many physicists and other individuals disagreeing with your claims and providing examples of differences between your claims and those of contemporary physics. In this thread, for example, you wrote, "QED doesn't model pair production in any meaningful way." Yet you seem not to be able to justify this, given that you apparently have not learned QED. I don't lie. And I refer to hard scientific evidence. You try describing how QED models pair production. Explain it in your own words. Explain how the photons disappear and the electron and positron appear. When you can't, you can apologise and concur. It's no false impression. This is the whole point of this news. QED doesn't model pair production in any meaningful way. It is a false impression because the part of the quote you omitted was the part of the quote that indicated how QED models electron-positron pair production as a higher-order process. The part of the quote you kept gave the impression that QED doesn't model electron-positron pair production in any way (which is false by virtue of the omitted part of the quote). "From quantum electrodynamics it can be found that photons cannot couple directly to each other, since they carry no charge, but they can interact through higher-order processes. A photon can, within the bounds of the uncertainty principle, fluctuate into a charged fermion–antifermion pair, to either of which the other photon can couple". Do photons interact with each other? If yes, how does this particle to particle interaction takes place? You may disagree with the precise way QED models electron-positron pair production, but don't misrepresent QED by implying that it doesn't model electron-positron pair production at all. You still have yet to provide any support for your claim that the way QED models electron-positron pair production is unsatisfactory. sweeping it under the rug as some "higher order process". It's not "sweeping it under the rug". It's saying that the Feynman diagrams describing the process has more (virtual) particles than the direct process, and also that the probability of the process is lower than the direct process. The link does not support your statement. Indeed, the link says (among other things) that: "In quantum electrodynamics photons do not interact at tree level. However, when radiative corrections are considered, it is found that they induce self-interactions of the photon field." Right. We've got self-interactions of the photon field. So photons interact with each other. And a photon can interact with itself. As per Dirac's belt, like something here. Now you go around and ask around about this self-interaction. You will get short shrift. What you will get is oh no, photons don't interact with photons, and they don't self-interact. And then you will perhaps appreciate why this work is so very important. In a nutshell it is this: when the photon field is self-interacting, we call it the electron field. Right. We've got self-interactions of the photon field. So photons interact with each other. And a photon can interact with itself. Please don't turn this into a debate over semantics. The interaction between photons does not occur at tree level, but is only found when radiative corrections are considered. In a nutshell it is this: when the photon field is self-interacting, we call it the electron field. Can you support the claim that an electron is a photon interacting with itself? Here you are making yet another claim that seems to contradict contemporary physics, yet one for which you offer no justification, at least within physics. It may help to understand Farsight's mission. Known IRL as John Duffield, he has posted widely his, er, idiosyncratic views of physics, always with absolute certitude of the correctness of his beliefs. To my knowledge, he has never published a peer-reviewed paper in which his assertions are expressed in rigorous mathematical form, and then subjected to rigorous examination. That, in itself, tells you pretty much what you need to know. ...We wouldn't expect to be able to make one electron out of one photon because of issues with conservation of charge and conservation of angular momentum. Yes, those are both very good reasons. Photons do interact, but as I showed earlier on QED is absolutely clear that it is only possible with the help of other fields which do carry charge. If you insist that photons interact directly (in the precise sense of "direct" which I defined earlier), you have rejected QED, whether you intended to or not. You are then in something of a pickle, unless you have a replacement to hand that can explain why, in experiments, pair production not only happens, but apparently happens in the precise way the Standard Model says it does, as far as observables are concerned. Not that I'm saying that such a feat is impossible. The Standard Model needs an electron model wherein charge is modelled! Charge is certainly modelled in the Standard Model; otherwise, we'd have no way of talking about charged particles. The full story (so far) is much too long for a forum post, but the back-cover blurb version is this: Every field in existence changes in some way when we subject the theory to a local gauge transformation (some fields opt for "never change at all", others opt for "always change by a complex phase factor determined by the transformation", etc. ), and because the theory as a whole has to be gauge-invariant, the way a field transforms determines how it must couple to the gauge field (i.e. the photon field). That in turn determines how it is deflected by electromagnetic fields, and therefore what result we get when we perform what we think of as a "charge" measurement. If you do want the full story (again, so far), I'm afraid you will have to pick up a book on field theory and prepare yourself for a bit of a hard slog. Assuming you are up to snuff with complex analysis, EM, SR, stat mech and non-relativistic QM, Zee's Quantum Field Theory in a Nutshell is a pretty good place to start (and not too heavy-going). I'm going to lay it on the line: there aren't two fields. Remember how I was saying the electric field and the magnetic field are "two aspects of the greater whole"? It's the same for the photon field and the electron field. The electron field is just the photon field with a twist. Whether you realised it or not, what you have described is a radical departure from the Standard Model, in which there are many fields (far more than just two) with very complex interactions, so we are firmly in "alternative model" territory here. I do not say that to be derogatory; it is well-known that the Standard Model has a finite domain of applicability, the boundary of which we have already touched upon. Many people are trying to find a theory which can extend that domain and, hopefully, at the same time simplify our model of nature (for example, by reducing the number of fields and simplifying their interactions). We are in the same very broad territory as occupied by all proposed extensions, enhancements and replacements to the Standard Model. Finding ourselves here is not a bad thing, in itself. But as we're laying things on lines I will say this: I (and most reasonable people, I hope) set the same bar for all new theories, however elegant, whoever comes up with them, that must be successfully cleared before I will be (provisionally) persuaded. It is this: the theory mustn't be unnecessarily complicated, and it must provably be at least as strong as the Standard Model when confronted with experimental data. On the other hand, if it is just theoretical viability that you want to argue for, the bar is of course a bit lower. As well as not being unnecessarily complicated, a viable theory must provably have the potential to be tested experimentally, and not contradict things we already know. Demonstrating this is an easier challenge than the previous one, to be sure, but not a trivial one. tk421 and Jilan like this. I do insist that photons interact directly. ...you have rejected QED, whether you intended to or not. You are then in something of a pickle, unless you have a replacement to hand that can explain why, in experiments, pair production not only happens, but apparently happens in the precise way the Standard Model says it does, as far as observables are concerned. Not that I'm saying that such a feat is impossible. I haven't rejected QED. I've merely pointed out an interpretational error, that's all. You have two photons in space. Nothing else. No electrons, no positrons, just two photons. They interact. End of story. No offence, but this is unsatisfactory. I really don't think what I'm saying is "alternative model" territory. We have two photons which interact to create an electron and a positron. The Standard Model just doesn't explain it, and it doesn't model the electron. It has gaps in it. Filling in these gaps isn't "alternative model" territory. What is, is the selectron. IMHO it just isn't sensible to propose a selectron when you have no clear idea what an electron is. The result is Reality Check at the LHC. Again I don't think we're into new-theory territory with all this. We're talking about "within the standard model" tweaks rather than some "beyond the standard model" replacement. What I'm arguing is this: photons interact. It's not some theoretical viability thing, it's an experimental thing. We do not know from QED that photons don't interact. But we will know from experiment that they do. It seems that you are still making patently untrue statements about QED. We know, from QED, that photons interact. This is something that is part of the theory but that has never been directly tested. Physics is time-symmetrical. Gamma-gamma pair production is like electron-positron annihilation played backwards. From this it can be seen that a red line representing a virtual electron/positron separates the two produced photons. Thus, even the time-reverse of electron-positron annihilation does not support the direct interaction between photons. In electron-positron annihilation the electron and positron suffer a mutual field disturbance and the result is two 511keV photons. In gamma-gamma pair production two 511keV photons suffer the opposite mutual field disturbance and the result is an electron and a positron. In electron-positron annihilation the electron and positron uncurl one another and the result is two 511keV photons. In gamma-gamma pair production two 511keV photons curl each other up and the result is an electron and a positron. I don't make patently untrue statements. The whole point is that people say that QED tells us that photons don't interact. When they do. Then some people say they interact via virtual electrons, only these aren't real electrons. And when all is said and done you start with two photons, and that's all you've got. But that's not the same as saying that a virtual particle isn't anything at all or doesn't exist. So, why can't a "disturbance in a field that is not a particle" act as an intermediary between the two photons? What about the case where a pair of photons produce a muon-antimuon pair or a quark-antiquark pair? Because the photons are the only things there. A "disturbance in a field that is not a particle" is just one little section of the field variation that we call a photon. Hmmn. I can offer this: the gluons in ordinary hadrons are virtual. They're what gives the bag model its elastic tension. But they have an underlying "field" reality. In low-energy proton-antiproton annihilation to gamma photons it doesn't disappear like magic. Imagine shaking a rubber mat. There is tension there. If there wasn't, you couldn't make a wave travel down the rubber mat. That gluon field is why the photon travels at c.
Last edited by Farsight; 05-25-2014 at 07:44 PM. There is a big difference between a lie and a mistake. A lie implies a statement written with a wilful intent to deceive by the author, rather than the author having a different view, whether that view is misconceived or not. Will all users please refrain from calling people liars, as ad-homs are not allowed here. Attack the argument, not the person, please. In other words, you are saying that virtual electrons/positrons do not exist at all in any form, contrary to QED. It is worth noting that QED doesn't just make qualitative statements, but also quantitative evaluations as well. Thus, the observation that electron-positron pairs are formed from pairs of photons is not enough, one has to account for the proportion of photon pairs that actually form electron-positron pairs. This doesn't really answer my question. My point is that photon pairs don't just form electron-positron pairs, but also other particle-antiparticle pairs. Thus, there is nothing particularly special about electron-positron pairs with regards to the photons that produced them. Also, muons (antimuons) are leptons (antileptons) for which gluons are irrelevant. I haven't rejected QED. I've merely pointed out an interpretational error, that's all. I'm afraid that it really isn't a question of interpretation; in QED, the only interactions which can ever take place between charged particles are via the electromagnetic field, and the only interactions which can ever take place between photons are via the charged fields. I gave a quick explanation of that above, but I will expand on it here to see if I can't clear up a few potential misunderstandings. Every prediction of the theory, every statement it has to make about nature, is contained in that Lagrangian. 2. Which terms involve direct interactions between the electron-positron field and itself? Easy; we need to find terms involving three or more factors of ψ. There are none. 3. Which terms involve direct interactions between the photon field and itself? Easy again; we need to find terms involving three or more factors of A. There are none. 4. What happens if we delete the interaction term identified in #1 above? We are left with a simple Lagrangian describing two free fields, something so simple we can solve it exactly without perturbation theory. There is a massive fermion ψ and a massless boson A, and neither field has any interactions whatsoever. There is, of course, no sensible notion of "charge". There are no scattering processes, no bound states, no annihilations, no pair productions, etc. We see quite clearly that the deleted interaction term is responsible for all of the interactions of the theory. 5. Returning to the full QED Lagrangian, with the interaction term restored, does this mean the electrons cannot interact with each other? No! Of course they will interact (or what a poor theory of electrodynamics this would be! ), but they do so indirectly, via the processes predicted by the coupling term . For example, an electron can introduce a kind of condition in the electromagnetic field which in turn influences the behaviour of other electrons, and so on. 6. How about photons? Are they forbidden to interact by QED? No! They too will interact, but they do so indirectly via processes predicted by the same coupling term . For example, a photon can introduce a kind of condition in the electron-positron field and thereby affect other nearby photons, if the conditions are just right. 7. We see that it is the interaction term , coupling the charged particles to the photons, which permits - in fact, demands - the flow of energy and momentum between the charged field and the photon field in precisely-goverened ways. It is this term which gives rise to the Lorentz force. It is also this term which makes electrons and positrons contribute to the charge and current density terms in Maxwell's equations in the classical limit, and which predicts annihilation and pair production processes. It is this term which predicts that photon-photon scattering must occur. The quality of being "satisfactory" is subjective, of course. As it happens, I find QED, and gauge theories generally, deeply satisfying. QED explains how what we observe as "charge" arises from very deep symmetries of the laws of physics. Those same principles that explains how "charge" arises also gives rise to precise, quantitative laws which tell us how "charged" objects interact. Those principles, in fact, demand the existence of the electromagnetic field! Above all, the theory of electrodynamics resulting from those principles has performed truly superbly in experiments. But it doesn't even end there! The same principles, generalised, underlie electroweak unification and quantum chromodynamics. There's no denying that there is room for improvement in the Standard Model, but it is truly amazing that such a simple idea, gauge symmetry, should work at all, never mind as amazingly well as it does. In my previous post, I attempted to express something in human language which, unfortunately, cannot easily be so expressed without discarding the greater part of its precision and elegance, the two very traits which make the idea so theoretically attractive in the first place. Nature apparently speaks mathematics, not English, and in particular seems to speak abstract, difficult mathematics. As such, I have not been able to do the idea proper justice in a forum post (although I have given you a decent pointer in Zee's book, and you can learn the precise details if you wish). However, forget that for a second. Suppose for argument's sake that the idea were not satisfactory, even when fully understood. The question is: why should it be? We do not have any a priori reason to suppose that nature should behave in a way which any one of us feels is satisfactory. A pearl of wisdom from one of the founders of modern QED is apt here; "We are not to tell nature what she's gotta be... She's always got better imagination than we have!" Markus Hanke, tk421, Farsight and 1 others like this. In other words, you are saying that virtual electrons/positrons do not exist at all in any form, contrary to QED. I'm not. I'm saying a virtual electron isn't a short-lived electron. I've already said the evanescent wave is the reality that underlies virtual photons. One might say the front portion of a photon is a +ve field variation and is therefore akin to a partial positron, whilst the trailing portion is a -ve field variation and is akin to a partial electron, and that this is the reality that underlies the virtual electrons of gamma-gamma pair production. It is worth noting that QED doesn't just make qualitative statements, but also quantitative evaluations as well. Thus, the observation that electron-positron pairs are formed from pairs of photons is not enough, one has to account for the proportion of photon pairs that actually form electron-positron pairs. Not a problem. I'd say what we have with QED is something that works, but wherein Feynman said "nobody knows why it works". Or words to that effect, and that such interpretational issues persist. Muons aren't stable, nor are mesons, and we've never seen a free quark. So I couldn't give an answer that related them to electrons and positrons. Look at π− → μ− + νμ then μ− → e− + νe + νμ and all we've really done is introduced neutrinos into the mix. My point is that photon pairs don't just form electron-positron pairs, but also other particle-antiparticle pairs. Thus, there is nothing particularly special about electron-positron pairs with regards to the photons that produced them. Also, muons (antimuons) are leptons (antileptons) for which gluons are irrelevant. But mesons do decay into muons. So where did the gluons go? btr: your post above is very good, I gave it a "like". You have clearly put a lot of time and effort into describing "the theory". But. There are some aspects of the theory that are wrong. The theory contains crucial errors, and scientific progress requires these errors to be corrected. Work to do so will constitute vital "within the standard model" effort rather than vacuous "beyond the standard model" speculation, and is crucial for the well-being not just of HEP, but of physics and indeed science overall. There is much work to be done. But right now, it's time for tea. Very informative. Thanks for writing it down. There are some aspects of the theory that are wrong. The theory contains crucial errors, and scientific progress requires these errors to be corrected. Firstly, there are problems with the Standard Model within its domain of applicability. For example, it is unclear how we should include the experimentally detected neutrino masses in the model (neutrinos were once thought to be massless, but it now seems that they are merely very light). Secondly, all models have finite domains of applicability, so we can always ask what lies beyond. We know, for example, that the Standard Model will break beyond a certain energy scale, so what happens there? We know that it does not include gravitation, so how do we address that? These are very difficult problems. There is some cause to hope that answering these may yield answers to the first set of problems I mentioned, but we don't know for sure. Work to do so will constitute vital "within the standard model" effort rather than vacuous "beyond the standard model" speculation, and is crucial for the well-being not just of HEP, but of physics and indeed science overall. Unfortunately, the problems with the Standard Model which I mentioned above are totally insurmountable within the theory as its stands. There is no getting around that fact that the model states, incorrectly, that neutrinos are massless. Likewise, there is no way to get a sensible vacuum energy out of the model. As for gravitation, there is no way to fit that into the picture as it stands (or to fit the Standard Model into General Relativity). Therefore, we are forced to go beyond the Standard Model in some way, and the only question is how radical the departure needs to be. Perhaps we are in a position similar to that of Glashow, Weinberg and Salam in the late sixties, investigating the weak interaction, and just need to augment the existing picture with some extra fields and symmetries to get everything in line (not that I mean to belittle their remarkable achievement). Or perhaps we are in a position similar to that of the physicists of the early 20th century, trying to understand why the Rayleigh–Jeans law fails at short wavelengths; the resolution of that involved the very furthest-reaching changes to our understanding of reality. As you said, fixing these problems is crucial for progress in HEP and elsewhere (cosmology, for example). So here's hoping for a breakthrough, whatever it may be! ...Firstly, there are problems with the Standard Model within its domain of applicability. For example, it is unclear how we should include the experimentally detected neutrino masses in the model (neutrinos were once thought to be massless, but it now seems that they are merely very light). Mass is just a measure of how much energy-momentum is not moving at c with respect to you. In an electron there's a modest amount, and its aggregate speed is zero, so there's mass. In a proton there's more, and its aggregate speed is still zero, so again there's mass. In a photon there's a modest amount of energy-momentum but it's moving at c so there's no mass. But if you slow that photon down say in glass it's got an "effective" mass. Slow it down more and this increases. Trap it in a mirror box and the aggregate speed is zero so all the energy-momentum is effective as mass. See this* Open the box and a radiating body loses mass. The neutrino is more like the photon than it's like the electron. And if its speed varies, its mass varies. Photon momentum is a measure of resistance to change-in-motion for a wave propagating linearly at c. Electron mass is a measure of resistance to change-in-motion for a wave going round and round at c. Think cosmic elastic rather than cosmic treacle. Make the Higgs field the photon field too. Secondly, all models have finite domains of applicability, so we can always ask what lies beyond. We know, for example, that the Standard Model will break beyond a certain energy scale, so what happens there? I don't care. And if HEP can gether that low-hanging fruit, nor will anybody else. We know that it does not include gravitation, so how do we address that? Pimp my ride. Where there's a will there's a way. Therefore, we are forced to go beyond the Standard Model in some way, and the only question is how radical the departure needs to be. You nail down the electron before proposing a selectron. Perhaps we are in a position similar to that of Glashow, Weinberg and Salam in the late sixties, investigating the weak interaction, and just need to augment the existing picture with some extra fields and symmetries to get everything in line (not that I mean to belittle their remarkable achievement). They didn't nail down the electron. Start with the obvious little things that fresh eyes can point you to. Start seeing the wood rather than the trees. Or should I say the marble. You obviously have some ideas about mass and electron structure which are not in line with the Standard Model. Even if you feel that it is merely a "reinterpretation" or refinement of existing modesl, I can assure you that it is not how it looks from the outside; from here, it looks very much the kernel of a replacement to the Standard Model's ideas of particles and the origins of lepton masses (and perhaps massive particle masses in general). So what next? To be blunt, you, or someone, needs to develop it and figure out how to actually use it (in fact, how to show other people how to use it; that is a strong test of how well-formulated a theory is). If you want an idea to be taken seriously, if you want to persuade people to give it serious consideration, you must take it seriously enough yourself to put the long hours in and develop it into a workable theory. Or, I guess, persuade someone else to do so. And of course, if the idea turns out to be wrong, you want to find out as soon as possible and move onto something else! Sorry to be so tardy, btr. You obviously have some ideas about mass and electron structure which are not in line with the Standard Model. Even if you feel that it is merely a "reinterpretation" or refinement of existing models, I can assure you that it is not how it looks from the outside; from here, it looks very much the kernel of a replacement to the Standard Model's ideas of particles and the origins of lepton masses (and perhaps massive particle masses in general). But it's totally in line with Einstein and E=mc². The mass of a body is a measure of its energy-content. In his E=mc² paper Einstein refers to an electron. So from here it sounds as if you're saying E=mc² is wrong. That's the size of it. btr. This is one that isn't going to go away. I've been thinking about what to do. I'm not sure what's for the best. I'm all for scientific progress, but it can ruin reputations. Lots of stuff is consistent with the equation (and more generally, with Special Relativity as a whole); that includes a lot of stuff that is wrong, as well as a few things that are (as far as we know) right. For example, if I were to invent a theory in which the only type of particle in the universe was a point-like, classical, spinless, non-interacting particle, that could easily be made consistent with Special Relativity (but would quite obviously be wrong). So, while I might be skeptical about your specific ideas, that doesn't entail that I am skeptical in the same way about mass-energy equivalence, or any other aspect of Special Relativity (within the domain where it applies, at least). Honestly, I cannot think of a single instance in the history of science where putting someone's reputation before progress was the right thing to do. If the idea is promising, what is best has to be to develop it into something concrete that other people can get their teeth into, as I suggested above, and find a way of getting it published (on the arXiv, for example). A quick double click on the quote icon works. Yep. 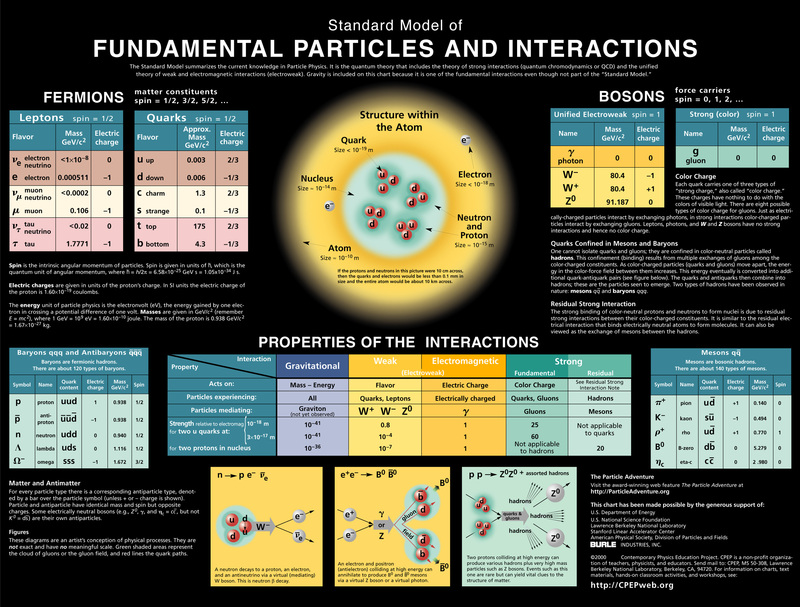 Since you mentioned pointlike, can I say I very much dislike the way the electron is sometimes portrayed as pointlike, see for example the particle data group poster. Very little of what I talk about is "my idea". It's more like "my interpretation" or "my understanding" after having read the original papers by the likes of Einstein and Minkowski and Maxwell along with what you'd think of as fringe papers by a variety of contemporary authors. You don't appreciate the enormity of it. Make sure you read this* then try this for size: photon momentum is a measure of resistance-to-change-in-motion for a wave propagating linearly at c, whilst electron mass is a measure of resistance-to-change-in-motion for a wave going round and round at c. Because the inertia of a body is a measure of its energy-content. Not a measure of its interaction with a field. And the only way out, is to say that said field is responsible for photon momentum as well as electron mass. So that field is then the same field as the photon field. * not the Nobel 't Hooft. I agree that what you have presented is not yet an idea. None of that addressed the point: you have not done the work to develop your "interpretation" into a scientific idea. There seems to be no reason why you should not try to do the work and there seems to be no reason why you shouldn't present your "interpretation" as extremely speculative until you have done the work. I am sorry but I don't see anything new in this. Trapped light behaves as if it has mass, yes I knew this. Trapped light might account for mass, I often think about this. Trapped light can account for the particles we find, their masses and their charges? Where to start? farsight, I read somewhere that the 97 slac experiment used four photons in the pair production. If that is true would not that suggest two photons to make the electron and two to make the anti-electron? This is the 97 slac experiment http://slac.stanford.edu/cgi-wrap/ge...c-pub-7564.pdfThe reason for using multiple photons was that they couldn't produce the necessary energy level with a single photon. I will read it carefully when I am less tired., but my first reaction would be that you would need several photons to allow for conservation of momentum etc. No, because pair production is the inverse of electron-positron annihilation, wherein the usual result is two gamma photons. It's definitely nothing new, because in his E=mc² paper Einstein said a radiating body loses mass. But for some reason HEP physicists can't seem to think of electron-positron annihilation in the same vein. Two radiating bodies lose mass. All of it. And then they're not there any more. In atomic orbitals electrons "exist as standing waves". And we made 'em out of light. But there's nothing in the Standard Model to say how pair production actually works, there's no clear description of what the electron actually is, and no understanding that this "hole in the heart of physics" needs filling in. e= √(ε0/4πc³) = √(8.854187817 × 10-12 / 338.5883200 × 1024) = √(2.6150304 × 10-38) = 1.6171055 × 10-19 C.
The electron's charge is 1.60217657 × 10-19 Coulombs. Some people dismiss all this as mere numerology, but I don't think it's wise to do so. read this. It's about defining the kilogram using g h and c. The kilogram is of course a measure of mass. Thanks Farsight. I would dismiss the middle example as numerology straight away. It's easy to see that the proton electron mass ratio must be dimensionless, but the square root of c isn't and the value depends what units you are working in. I'll reserve judgement on the other two. I'm sure there will be some helpful comments coming! Sorry, I made a mistake and omitted a term like the n in the first example that gives you the right dimensionality. What's a bit odd about c is that we use "the motion of light" in the NIST caesium clock to define the second, and we also use "the motion of light" to define the metre. We think of c having the dimensionality of time divided by length, but time and length are both derived from light moving. which seems to work and is pretty cool! Last edited by Jilan; 06-22-2014 at 07:41 PM. Cannot get the hang of this latex business. LOL! The first part about the Planck length actually doesn't come into it though. That is how the metre is defined now as the speed of light is a good constant measure (lol) but originally it was defined as one quarter of the circumference of the earth/10,000,000. If you've got the wavelength then E=hc/λ and E=mc² and the energy has a mass equivalence. Note that action h has the dimensionality of energy x time or momentum x distance and that in depictions of the electromagnetic spectrum the wave height is always the same. When I was talking to Andrew Worsley about it we were likening it to plucking a guitar. Your pluck is always the same regardless of the wavelength. All good fun! Correct. It was by equating the two expressions for the Compton wavelength I arrived at the expression for the mass of the electron. I didn't say that Plancks's constant didn't come into it! The bit that seemed irrelevant was the expression with G in it. ℓp=√(ћG/c³). that in depictions of the electromagnetic spectrum the wave height is always the same. Well, now we have the theology of Einstein, numerology, and physics through popular clip art. Still no predictions, still nothing that can be compared to measurement. Uh, OK. The thing that's interesting about the G is that a gravitational field is the "reaction to the action", as it were. By the by, I don't know if you saw Leonard Susskind trying to explain the Higgs boson, but at 2 minutes 50 second he was waving his marker round saying angular momentum is quantized. It reminds me of the rotational motion associated with ocean waves. Roll your finger around fast or slow, but roll it round the same circumference, and you're kind of emulating the h in a photon. Which is another thing that isn't really explained. If you asked btr what a photon is, I'm not sure he'd be able to give you much of an answer. If you asked btr what a photon is, I'm not sure he'd be able to give you much of an answer. It's nice of you to insult other posters who bothered to learn the relevant science, just like you insult the scientists that actually do the work, but do you have anything to offer us that will allow us to do anything in the physical world? Or are you just trying to look smart by saying physics-like things and insulting others? Physbang, it didn't appear as an insult me. Farsight was just trying to say that even the best physicist would struggle with this one. It was actually a compliment I reckon. Farsight, you are correct, the maths is the same. Quantum mechanics is all wave equations when you dive into it. I studied it at college many years ago and always enjoyed it. I'm working through Griffiths at the moment just for fun and totally loving it. Happy days! Yep, everything is waves. Some say everything is fields and waves, seeing as it's quantum field theory. But there's a funny little wrinkle to all this "turning light into matter" stuff: you make a wave go round and round so it looks like a standing wave, and then the field variation that was propagating at c looks a standing field. Like, the photon is more fundamental than the field it is said to mediate. I think that's pretty cool myself. It definitely wasn't an insult, btr is one of the good guys. Amazingly when you ask around saying What is a photon? you can't get a clear answer. There's a book with various opinions that came out of a SPIE conference, see http://www.amazon.co.uk/The-Nature-L.../dp/1420044249 but it's very expensive. I haven't read it. Amazingly when you ask around saying What is a photon? you can't get a clear answer. I don't find it quite as amazing as you do. Each answer to such a question simply leads to another. At some point, you are forced to stop. I'm not saying that this state of affairs should inhibit us from asking questions, but I am saying that not getting a clear answer at some point is inevitable. "The most inappropriate name ever given to the Higgs boson is ‘The God particle’. The name gives the impression that the Higgs boson is the central particle of the Standard Model, governing its structure. But this is very far from the truth". "The Higgs sector is that part of the theory that describes the Higgs mechanism and contains the Higgs boson. Unlike the rest of the theory, the Higgs sector is rather arbitrary, and its form is not dictated by any deep fundamental principle. For this reason its structure looks frightfully ad hoc." "In summary, the Higgs mechanism accounts for about 1 per cent of the mass of ordinary matter, and for only 0.2 per cent of the mass of the universe. This is not nearly enough to justify the claim of explaining the origin of mass". "It's a nice story, but one that some find a little contrived. "The minimal standard model Higgs is like a fairy tale," says Guido Altarelli of CERN near Geneva, Switzerland. "It is a toy model to make the theory match the data, a crutch to allow the standard model to walk a bit further until something better comes along." His problem is that the standard model is manifestly incomplete. It predicts the outcome of experiments involving normal particles to accuracies of several decimal places, but is frustratingly mute on gravity, dark matter and other components of the cosmos we know or suspect to exist. What we need, say Altarelli and others, is not a standard Higgs at all, but something subtly or radically different - a key to a deeper theory"
Note that a lot of what you hear about "the Higgs" in the popular media comes from the CERN publicity department. It's intended to promote CERN, it isn't necessarily an accurate reflection of what CERN physicists really think. But they aren't going to jump up and challenge a CERN press release. I think the important point is that HEP physicists can't give you a clear explanation of what a photon is, what an electron is, or what actually happens in gamma-gamma pair production. The really important point is that you do strictly worse than any physicist in the same task: you can't even describe the way a photon behaves in any physical system. We shouldn't overlook this horrible failure of Farsight-Relativity. OK, but whoever's idea or theory or interpretation, whatever its pedigree, somewhere up-thread you said that the electron is really a "chiral configuration of the photon field", a "chiral-bispinor electromagnetic wave thing", a "rotary standing-wave standing-field configuration", or a "self-trapped photon". In other words, you believe that in some kind of way the particles we see as the electron and the photon are actually different states or manifestations of the same underlying field. The present Standard Model (as you acknowledged in post #9) does not model the electron and photon in this way, and whether we describe this proposed change to the SM as being "within" or "beyond" it, it's still a proposed change. Therefore, if you want to propound this idea, if you want to successfully and honestly persuade others of its worthiness, you have little choice but to accept the burden of proof that comes with that. To start with, as I think I said earlier, you should get it developed into some form of mathematical model that other people can pick up and play with; it's the only way of discovering whether the idea really works. In the words of Sheldon Cooper, "this is a classic example of Münchhausen's Trilemma: either the reason is predicated on a series of sub-reasons, leading to an infinite regression; or it tracks back to arbitrary axiomatic statements; or it's ultimately circular." In physics at least, we always go for the middle option; everything tracks back to unexplained axioms or brute facts, much as you wrote. Even if this idea of the electron being a special configuration of the photon field turned out to be correct, that would presumably raise questions like "why does the photon field have exactly those properties, leading to electrons with that mass/charge/spin?" I love that you quote Munchhausen by proxy. I have no objection to Farsight's wishing for an ultimate answer, but I do object to his criticizing the absence of an ultimate answer by mainstream science. He seems unaware that any answer he comes up with would be vulnerable to the same critique, as you point out. I don't mind the absence of an ultimate answer by mainstream science. But I do mind guys like John Ellis banging on about SUSY and the selectron and other exotica when there's so much plain-vanilla "within the standard model" work to be done. Sorry, I have to go out now. I'll reply further later. Fair enough. But it's not as if I'm saying something total novel and revolutionary. In classical electromagnetism we deal with electromagnetic waves and charged particles which have an electromagnetic field. ...even if this idea of the electron being a special configuration of the photon field turned out to be correct, that would presumably raise questions like "why does the photon field have exactly those properties, leading to electrons with that mass/charge/spin?" Because electromagnetism is all about curved space, wherein action h can be expressed as momentum x distance, and when you make an electron you're curving space full circle. Google on electromagnetic geometry. I absolutely did that on purpose. Well, I think we've gone about as far as we usefully can with such analogies and pictures. Until I can actually get hold of this theory in a useable form, test it, torture it, and satisfy myself that it works and does not contradict what we already know, I don't suppose I have anything constructive to add. Whatever that might possibly be. "The book shows electromagnetism from the point of view of space and time in geometrical aspects. It is quite a new description of electromagnetic field and the authors should be proud of it. Special attention of a reader should be focused on the introductory part of the book, where the fantastic picture of the history of electromagnetism and the long-lasting controversy as to the description of physical world is presented". "This book treats the somewhat familiar subject of fundamental electromagnetism, ie Maxwell's equations but in a new way. The authors thoroughly explore the relationship between the electric and magnetic fields and the geometrical and topological aspects of the space in which they are embedded. Experts who feel that there is nothing new to be said about Maxwell's theory and its interpretation will learn new insight from this book. However the book is marred by rather too many typographical errors and also some equations are wrong (for instance the Lorentz transformation equations early on in the book). This detracts from the books usefulness to the beginner who should have a good text on electromagnetism available as well as this book. There is a also a useful historical introduction to the history of the evolution of Maxwell's theory. If the faults are fixed for the next edition, this work will be a reference for many years to come." You explain electron mass then the proton/electron mass ratio and merge the photon field with the electron field and explain the electron in terms of geometry (see above). Then you knead in the gluon field and the Higgs field and say gravity is the reaction to the action and reclassify neutrinos in with the photon, and so on. There's oodles of within-the-Standard Model work to do, and it will be exciting stuff once the impasse is broken. I'm going to quote the above in order to preserve it. Farsight's response to the idea of actually working out the details of his own theory is to recommend a clearly flawed work of someone else on a different theory. A book that doesn't present science through pictures, but through geometry, a form of mathematics. Farsight, without some form of mathematics that someone, somewhere, can relate to your thoery, you have nothing. Derive from your theories how to calculate those quantities. "Your theories" being what you are advocating, independent of whom you think deserves the credit for them. and merge the photon field with the electron field and explain the electron in terms of geometry (see above). That's worthless. The electron is a 4-component spinor field, while the photon is a 4-component vector field. They transform differently under rotations and boosts. There is also no way to get a spin-1/2 field from combined states of spin-1 fields. It's mathematically impossible, like 2 + 2 = 5. Then you knead in the gluon field and the Higgs field and say gravity is the reaction to the action and reclassify neutrinos in with the photon, and so on. However that's supposed to work. There's oodles of within-the-Standard Model work to do, and it will be exciting stuff once the impasse is broken. It's Beyond the Standard Model because it departs from the Standard Model's Lagrangian. ...That's worthless. The electron is a 4-component spinor field, while the photon is a 4-component vector field. They transform differently under rotations and boosts. There is also no way to get a spin-1/2 field from combined states of spin-1 fields. It's mathematically impossible, like 2 + 2 = 5. So what's with the mathematically impossible? You know we can create electrons and positrons out of one or two photons. I'm sure everybody here does. So now wikipedia is the revealed truth? You are claiming that there is some self-interaction of photons that makes a photon have all the properties of another particle. Show us the mathematical details. There is a difference between making one fermion and making two fermions from some bosons. The former is a mathematical absurdity and it violates some important physical principles, while the latter is completely feasible. That's because two fermions' spins add up to 0 or 1 depending on their relative orientations. That's an integer quantity, and it has no such problems. Nobody said you can make one fermion from one boson. Or more than one boson. Surely we all know about pair production? But what we don't know is how you explain how pair production works in details that match observations. Perhaps you don't know the details and you are merely dogmatically asserting this claim; in that case you would merely be mistaken in a way that would not stain your character. I've said elsewhere that two photons displace each other into themselves, such that each permanently displaces itself into a closed chiral double-loop path. Then a field variation looks like a standing field. Conservation of angular momentum applies, hence conservation of charge. Only we don't call them photons any more. We call them electrons and positrons. Annihilation reverse the process. It seems that you are still mistaken in a way that is in no way a stain on your character. When you are ready to take part in a physics discussion, then present the relevant physics. Your ideal about turning light into mass is very good. In reply to Farsight, re: your #1 post. In this circumstance, how would light even be emitted from a source? Gerry: this is nothing to do with cold fusion, it will work. What a excellent thread! Your ideal about turning light into mass is very good. You just start with more than 1022keV of input energy. Then you make a 511keV electron and a 511keV positron, and each has kinetic energy, so they fly apart. As per pair production where one photon is split over a nucleus, see images. No, that would be a lie. Sad as it is that you are trying to reference wikipedia (and a current version of wikipedia, not an older version as you have done in the past! ), nothing in that page supports or even resembles your batshit crazy idea. In reply to btr, re: your #33 post. more "magic particle inter-actions" and it WILL WORK! And there can NEVER be an effective challenge to such methodology...it is impossible. it superior to the Standard?) The answer? NO...because modern physics refuses to admit anything else might have merit, for if one aspect is "wrong" then the entire edifice will crumble! In reply to Farsight, re: your #84 post. The "cold fusion" was a reference to the "light into matter"....so, yes...it does pertain, in that both examples are unprovable and unworkable! (I read examinations of this "light into matter"
"Capture a photon w/ a crystal?" (using a laser in a "trap field) Yes...I agree. An excellent example of "how photographs work!" I don't know if this has been mentioned already, i.e. has the following reaction been discussed? In further reply to Farsight, re: energy into matter. Soooo..."your magic is stronger than standard accepted forms of magic?" As per Wiki? Sorry, no dice and no sale! who "know more than Albert because he didn't have access to an LHC".